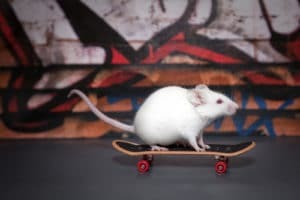 Degus love to roam around and have a tendency to get irritable when they are unable to exercise. In this way, you will need to purchase a large cage to make sure they have enough space to undertake their daily activities. A cage with multiple levels is ideal, and kitting it out with play areas will ensure that they have enough stimulation to keep them entertained. In terms of materials, make sure that the cage is made of wire, not wood or plastic, as degus are notorious for chewing through materials. Similarly, avoid wood-based shavings for bedding and opt for paper, tissues or hay. This will provide a safe and cosy environment and minimise risk. Degus need a diet which is low in carbohydrates and high in roughage. 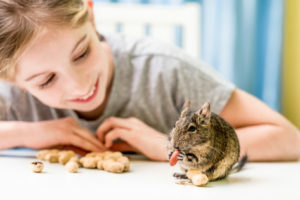 To make sure they are kept well fed, most degus owners opt for rodent blocks and guinea pig pellets, as these are relatively cheap and will provide the nutrients the animals need to stay healthy. 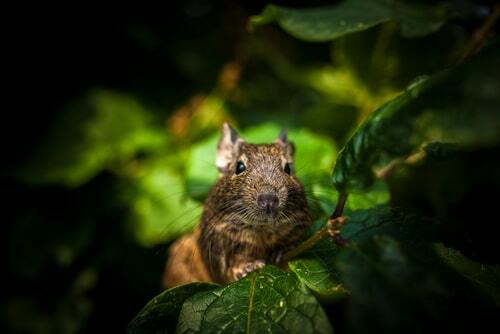 To mix things up a little, owners may want to offer their degus some fresh vegetables to nibble on, including carrots, sweet potato, broccoli, green beans and leafy greens. It is advisable, however, to avoid feeding your pets large quantities of vegetables which fall under the cabbage family, such as Brussel sprouts and kale. Fruits should also be kept to a minimum as they are high in sugar and degus are highly susceptible to diabetes. Water baths are not necessary for degus. Instead, use a shallow bowl filled with chinchilla bath dust, and give your animals a dust bath a couple of times a week. The beauty of a saltwater fish tank in unlike anything else. A saltwater fish tank will enable you to keep and admire vivid, exotic marine fish like lovely neon goby, graceful firefish, serene blennies, brilliantly colored tang, and more. But keeping a saltwater fish tank is not an easy task. Even experienced hobbyists admit that this type of fish tank is difficult to maintain. A rigid maintenance schedule, regular water upkeep, and fish feeding schedules are just a few things you need to consider. A little experience with freshwater fish tanks and freshwater fish in general may help you get started. This is a guide to setting up a saltwater fish tank for the first time and the basics of caring for saltwater fish. With some time and experience, you can set up and enjoy your very own thriving saltwater fish tank! Before you even think about getting fish, you need to decide what type of saltwater fish tank you want to keep. These aquariums will be all about the fish. There will be minimal decoration, maybe just some coral skeletons (not live coral) or fake coral. This is a great setup to begin with, and there are plenty of hardy fish like tangs, damselfish, and several captive-bred fish, like the iconic clownfish (aka. Nemo!) that you can keep in these tanks. We highly recommend that you begin with a fish-only tank. This is the cheapest tank to maintain and is good for learning the ropes of marine fish-keeping. By ‘FOWLR’ we mean ‘fish-only-with-live-rock’ tanks. These tanks have fish and some live rock, which are really pieces of live coral from old coral reefs. The live rock is occupied by many different life forms like sponges, invertebrate creatures, and nitrifying bacteria. Live rocks look beautiful, but also need special attention. FOWLR tanks are generally not recommended for beginners. These are the most expensive and challenging of marine tanks. Reef tanks are all about the corals and other invertebrate marine life: there are often few fish, or even no fish, in a reef tank. You’ll need to carefully and regularly monitor water conditions so the sensitive invertebrates survive and thrive. Again, reef tanks are usually not recommended for beginners. 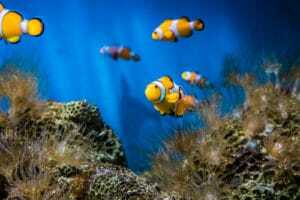 While it is possible to begin with a 10-gallon to 30-gallon tank (called nano tanks due to their small size), saltwater fish are used to living in large ocean spaces and, as a general rule, the bigger the fish tank, the better! Larger tanks are easier to care for, because if something goes wrong with maintenance, the larger volume of water is able to buffer the effects. It is also recommended that you choose the tank size based on the mature (fully grown) size of the fish you’re planning to keep. Aiming for around 10 gallons for every fish is a good rule of thumb, but always consider your own fish and plan accordingly. Finally, if you have to choose between short and wide or tall and narrow, it is strongly recommended that you get a short and wide tank. Fish will have more space to swim, air exchange will be better, light will penetrate better, and it will be easier to reach all the way to the bottom during maintenance without having to put on a wetsuit! For a fish-only tank, you don’t need special lighting – pick whatever makes the fish look good. However, if you’re putting in live rock, you’ll need power compact lighting or expensive metal halide lighting. Corals need a type of lighting called actinic lighting. In addition to a water filtration system, you can get a protein skimmer and sump system that will get rid of dissolved organic compounds, maintain water pH, improve the clarity of water, keep algae in check, and maximize the oxygen available. There are many different types of protein skimmers. Adding live rock also helps with filtration, but that will need additional care. For a fish-only tank, a laminar power head with a jet-stream and direct flow is fine. If you’re putting in coral, however, you should set up two power heads across one another at opposing ends of the tank so the water jet from both meets in the middle. This will create the turbulence that corals need. As for size, choose power heads that produce a water turnover of at least 10 to 20 times the size of your tank. For example, in a 100-gallon tank, your power heads should produce a total turnover of at least 1000 gallons per hour. You’ll either need to buy pre-mixed saltwater from your pet store or manually mix salt with water and keep it in a large bucket for your water changes. If you’re mixing your own saltwater, you’ll need to keep the bucket heated with a heater and circulated with a power head. You’ll also need a hydrometer to check salinity (ideally 1.020 to 1.023). Every time you make a water change, you will need to use this saltwater. For a fish-only tank, you’ll need basic test kits for pH, nitrite, nitrate, ammonia and alkalinity. For live rock systems, you’ll need to add calcium. If you’re keeping crustaceans, you’ll want to add iodine. There will be other additives you’ll need depending on the type of marine life you’re keeping. This includes buckets of various sizes, a siphone tube for water changes, an algae scraper, nets, replacement parts for your equipment, etc. Now that you’ve got everything together, you’re ready to set up your tank. Place the tank on a stand and make sure it’s level. Leave clearance for equipment cables. Next, test all your equipment such as heater, filtration system etc. Fill the tank with freshwater and leave it for two days with the equipment running. Check for leaks, and make sure the water temperature is within 2 degrees of 26.7 degrees C or 80 degrees F. Empty the tank at the end of two days. Fill the tank with saltwater. Test it with the hydrometer. Add substrate. This could be sand, gravel, crushed coral or shells, or even peat. The substrate will contain good bacteria to create the ideal tank environment. Run the tank for two to three days without fish, to make sure the temperature, water clarity, pH, nitrate, nitrite, ammonia and other water parameters are ideal and the system is cycling properly. Cycling refers to bacteria working to maintain the right levels of gases in the system. You want the ammonia and nitrites to come down to zero before you’re ready to put in fish. Your test kit will tell you what you need to do. You’ll need patience during this time, as you wait for the perfect cycling to kick in – anywhere between 5 days to a couple of weeks depending on the substrate you’ve put in. Finally, you can add fish. Ideally, add two or three first, and then add the rest. You should start out with hardy fish that are easy to care for, rather than species that don’t have a high success rate in captivity. You’ll be less likely to abandon your first tank if you lose fewer fish on your first attempt. Unfortunately, there will likely be a few deaths as you learn. Make sure to learn as much as you can about the fish you’re interested in. The next section will help you! Learning what saltwater fish to choose for your tank and how to care for them is a big part of the beginner experience. It’s good to learn as much as you can about marine life and different varieties of fish. Additional knowledge can be helpful in the future, when you may think about upgrading or expanding your fish tank. Since this is a starter experience, there is no need to make things more difficult by choosing fish that are difficult to care for. We list some good starter fish below. You may think that since saltwater fish come out of the ocean, they are all cared for the same. This is not true, because some fish are from cooler, deeper waters while others are from reef environments. It is best to not mix these different types of saltwater fish to avoid different tank requirements. Fish that come from the same area of the ocean are more likely to get along, creating a hospitable aquarium environment. Choosing the right fish for your tank involves more than just their temperament. 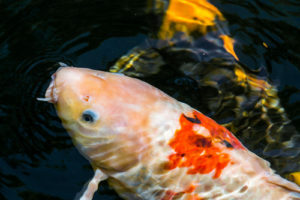 You need to consider factors such as space requirements, how easy they will be to feed, the size and hardiness of the fish, and how much they will cost. As a general rule, keep in mind that saltwater fish are sensitive to tank changes. Stability is key when caring for your fish. What saltwater fish are good for beginners? So, how do you go about choosing fish for your saltwater tank? Well, like most things, there is more to it than you may think! As beginners tend to have smaller tanks, it is wise to choose starter fish that need less space. You should consider the behaviors of the fish, as well as their adult size, when figuring out space requirements. Saltwater fish need more food than freshwater fish. Unfortunately, saltwater fish tend to be incredibly picky when it comes to eating because they are not accustomed to eating food that isn’t live. Avoid choosing fish that need live food, as they are not ideal for beginners. One of the most important factors in setting up your saltwater fish tank is compatibility of the fish. In other words, the fish must get along with the other fish in the tank. Aggressive, bigger species will more than likely prey on smaller fish. Also, two males of the same species may spar with one another. Any species of fish can get aggressive if they do not have enough space in the saltwater tank. Keep these things in mind when thinking about compatibility and choosing your fish. If price is an issue, focus more on the tank and the equipment rather than getting lots of fish. You can just purchase one or two fish for now and consider more later, especially if you are getting a bigger tank. Saltwater fish are usually more expensive than freshwater fish, so keep this mind when choosing your fish. It’s a good idea to choose saltwater fish that are hardy and can adapt well to changes in water temperature and quality. Since you are a beginner to this hobby, you will more than likely have a trial and error experience for one or more fish. That being said, hardy fish will be able to stand changing conditions a little more easily while you are starting out. When choosing your saltwater fish, keep in mind that they will grow up to be adult fish. 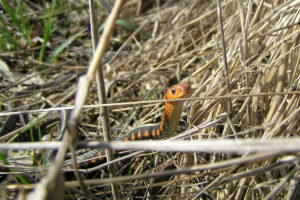 This means that they will get bigger – maybe a lot bigger depending on the species. Choose fish that will thrive in your tank when they are adult size and not just when they are super small. They will eat pretty much anything, so they’re not picky eaters! But they need lots of hiding spots in the tank. Though they have a tendency to be aggressive to other fish, they are hardy and easy to care for. A good beginner’s choice, damselfish are inexpensive and small. They come in all kinds of bright cool colors. They can be aggressive, though. Another great fish for beginners’ saltwater fish tanks, gobies are small and inexpensive. Before you begin taking on the hobby of having a saltwater fish tank, be sure to do your research. It’s wise to read as much as you can about saltwater fish tanks and/or watch videos online about them. Everything from water chemistry and proper setup to choosing the right fish and tank can all make or break your saltwater fish tank experience. It can seem overwhelming at first. But it’s not true that beginners have to start with freshwater fish – with enough preparation, you can start with a saltwater tank as the first step in your fish-keeping hobby. The crested gecko ranks among the most popular reptiles for beginner owners, being friendly little creature that is quite happy to be handled when taken out of its vivarium – although, as with all lizards and reptiles, handling should be kept to a minimum. Crested geckos don’t normally grow more than eight inches in length and are easy to look after, as far as pet care goes, since they don’t require live food in their diet (although they do still appreciate the occasional live insect). Like the crested gecko, the leopard gecko is another popular lizard for the newcomer. 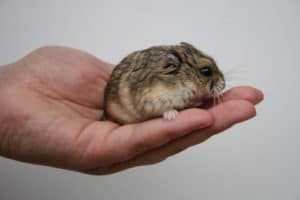 They are small and non-aggressive, and easy to handle when taking them out of their cage for cleaning. Leopard geckos subsist on live crickets, with an adult getting through 10 to 15 of the insects every day. Feeding your leopard gecko is pretty easy for the new reptile owner, as they do not overfeed, simply rejecting their food once they are full. 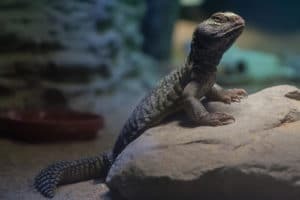 By far the most popular breed of pet iguanas, the green iguana is one of the larger domestic reptiles, so will require a suitably sized vivarium to live in. 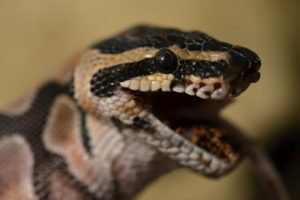 They are tolerant towards being handled and, being totally herbivorous, only eat fruit, flowers, roots and leaves, rather than the live insect diet of many pet lizards. Both these traits make them ideal pets for a beginner. There are eight species of bearded dragon, and all make great pets for beginners. They are easy to handle, enjoy the affection they receive from their owners and behave with affection in return. 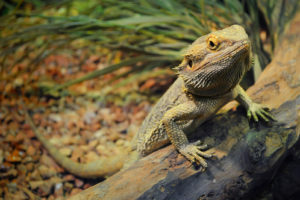 Not only that, bearded dragons are easily controlled and are happy to explore outside of their tanks.